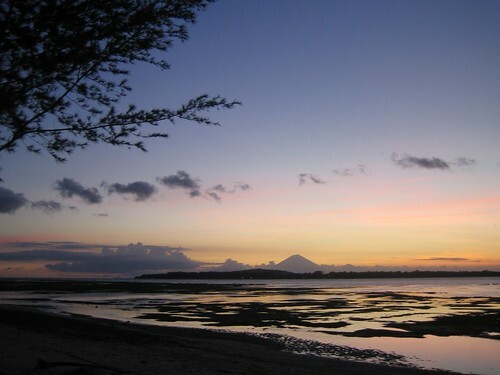 I first visited the Gili Islands in 2001, opting for the chilled out Gili Air over the party island of Gili Twangaer and the mosquito infested Gili Menos. On the first visit we stayed in Bunga bungalows, returning 5 years later in 2006 to find the bungalows had been a casualty of the Bali bombings and closed. We instead stayed in the almost identical bungalows next door called Matahari, the huts were idyllically situated right on the beach. 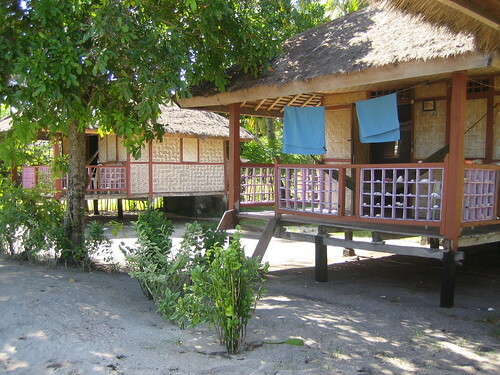 The huts where basic, the non flushing toilet and shower out the back had no ceiling, but all you really need for a relaxing stay is a bed with a mosquito net a porch with a hammock and a view of the sea. 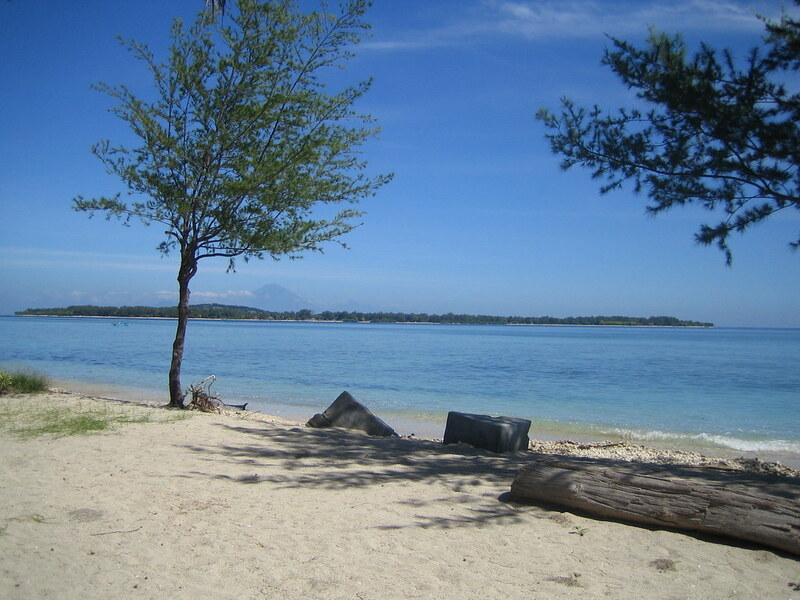 The beach on the west of Gili Air is not the best for swimming, it really needed to be quite high tide for a good swim but when it was it really was beautiful, the water is warm and crystal clear. The beach on the South East is deeper and better for swimming and good for snorkeling though there is quite a current and you can get tired pretty quickly. 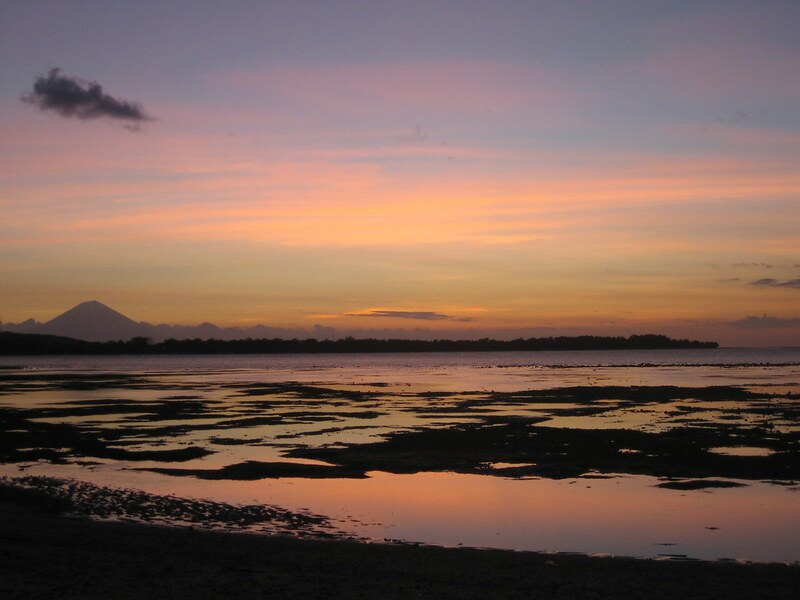 One of the most amazing things about staying on the West beach of Gili Air are the incredible sunsets that without fail unfold before your eyes every evening. As the sun sets behind the volcano on Bali siloetted it becomes silhouetted and the sky lights up with blue then orange colours. The Mata Hari Bungalows are run by a friendly family consisting of Mama and her children, we were made to feel really welcome and one night helped the family fish, looking for small fish caught in he coral at low tide, we also got taken to a cricket fight which was fairly odd. Mama seemed legendary across the island for her cooking and she really was a great cook. We ate at the bungalows all but one night, we soon learnt that Mama was an incredible cook and that we would best eat at Mata Haris everyday! Selecting our fish for dinner in the morning, on a few occasions we were simply told by Mama what was for dinner. The traditional Indonesian food that Mama produced was fantastic and I don’t think we’d have found it on many restaurant menus. The highlight of the great food was probably the red Snapper and Ole Ole. We stayed at Mata Hari for 5 nights, eating breakfast and dinner all but one day. The cost for accommodation was R30.000 a night, all in it cost R474.000, about £20 at the time! 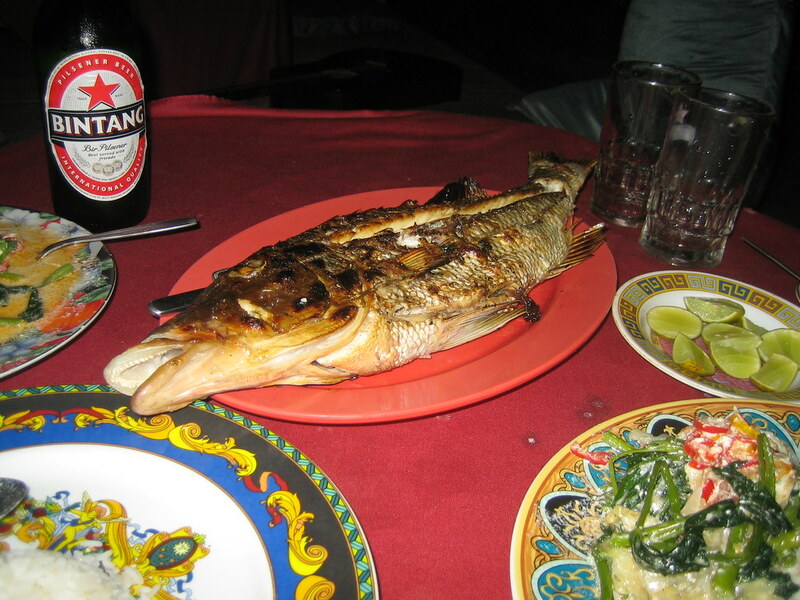 Bus to Padang Bai, ferry to Lombok and boat from Bangsal to Gili Air. All the important information about every country around the plane. including: flag, location, language, climate, weather, time zone, electricity type, currency, driving side, pictures and more. Hey, glad you like the snow pics, all gone now, would love to be in Indonesia right now! When we we last visited Gili Air in 2006 we stayed in a beach hut for R30.000 a night (about £1.75) so its pretty cheap, just haggle hard. I was there in December. Visitors were few, which made for some great deals. I met one guy who'd been the only guest at his hotel for three weeks. I want to say he was in the process of talking them down to $4 per night by that point. I spent a little extra and stayed at the Sunrise hotel. Their rates vary with traffic, like anywhere else, but I think I spent $17 per night. That bought me a new, two story bungalow with air-con, cold shower, hammock, day bed and daily breakfast on the beach. While the rooms don't have a view of the ocean, the hotel sits in front of a really nice stretch of sand and snorkeling spot across from Lombok. The best thing to do is just get there and walk around until you find a place that suits you. A few touts, while polite, will greet you at the boat landing and give you the pitch for their hotels as soon as you set foot on land. The island is so small, though, that it really doesn't take a lot of time to wander around and price shop. I thought the east side of the island (take a right when you get off the boat) had the nicest beach. On the west shore and portions of the north, the beach is mostly broken coral. Truthfully, though, I can't really think of a bad spot on the island. The food is delectable, the surroundings are sublime and you'll have made friends with half the island by the end of your second day. Snorkeling gear cost $2-3 per day to rent. Beer is about $1. Mixed drinks cost two to three times time that, although you can sometimes get a better deal if you buy some of the, how shall we say, locally produced spirits. I remember food costs being similar to Bali. It's not crazy cheap, but you can eat a really good meal for $5. Nighttime spear fishing was about $15. The only expensive thing you may want to do is charter a boat to one of the other islands. A girl who took the trip to Trawangan for a full moon party said it costs about $30, although that is split by everyone in the boat. If their schedule meets your needs, though, the local ferries are very inexpensive. Sorry for rambling. I hope that helps. I meant to stay a couple nights on Gili Air and I ended up staying five. It's the kind of place that makes you lose your sense of time and forget why you wanted to live anywhere else.